When it comes to video editing, Macs are made for it. Even Hollywood epics have been edited on Macs so we’ve taken a look at the best camcorder for Mac in 2019 under $500 which are ideal for using with iMovie. The best video cameras for Mac nowadays are those that, like the best Mac compatible digital cameras, record to SD Cards. These are also sometimes known as “Flash Drive” camcorders because they are the easiest to transfer video to a Mac and start editing video in iMovie or other video editing software for Mac. The good news is that all Macs built from 2009 onwards have SD card slots for you to pop-in a camcorder SD card and transfer video immediately. And even if your Mac doesn’t have an SD slot, you can buy a USB SD Card Adapter for just a few dollars which simply plugs into your Mac’s USB port and allows you to connect SD cards to your Mac. Here then we list the best best camcorders for Mac of 2019 in order of ranking. The Canon VIXIA HF is a versatile camcorder that has both a 64GB internal flash hard drive and SD card slots. The internal hard drive can record up to 24 hours of video the possibility of extending it with SD cards. Of course, to transfer the video from the internal hard drive to your Mac, you need a USB cable but you can opt to just use the SD card slots instead. The Canon VIXIA also has a very good Optical Image Stabilizer to help stabilize your shots and you can stream video to your Android or iOS device. One unusual touch with the VIXIA is that it supports dual recording in both MP4 and AVCHD. While MP4 won’t import into iMovie without conversion, AVCHD does and so you can import your video directly into iMovie on your Mac no problem. Without going into too many boring details, MP4 and AVCHD are basically very similar formats but AVCHD is a more standardized format that’s guaranteed to work with most BluRay players for example and AVCHD files are generally easier to manage if they’re very large. MP4 on the other hand requires conversion before importing into iMovie and sometimes doesn’t work in certain BluRay players and other playback devices. With a 3 inch touch screen and a long life battery, the Canon VIXIA HF is an excellent camcorder for iMovie. 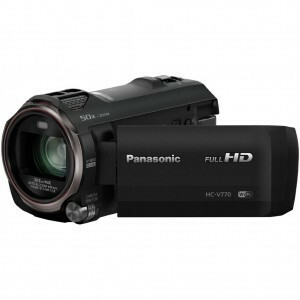 The Panasonic HC-V770 records video to SD Cards and provides excellent image quality with 20x optical zoom. The HC-V770 uses High Dynamic Range (HDR) for especially clear shots in low light with backlighting. The V770 has a BSI sensor which gives very clear image quality and other useful add-ons are the wind shield zoom microphone and Wi-Fi function which enables you to connect it to your iPad or iPhone. The HC-V770 is excellent in low light and has 35 LED bulbs that can cast light up to 25 feet away. In general, when it comes to low-light, the Panasonic HC V770 is considerably superior to the Canon Vixia and the LED bulbs in particular allow you to shoot in low light that the Canon simply can’t perform in. The camcorder is also available as part of a huge bundle of useful added extras including a 50-inch Compact Tripod (which is very light but a bit flimsy), a padded carrying case, rain cover and 64GB SD cards. Unfortunately for some reason Canon has discontinued the FS300 although it is still available from Amazon and worth being aware of, not least because it’s got the best battery life and optical zoom lens in any SD camcorder out there. The Canon FS300 is a good-looking camcorder that plays very well with Macs. The Canon Fs300 can record around 20 hours of sharp, clear video onto a removable SD card. One of the most impressive things about the Canon FS300 is the battery life which seems to just go on and on compared to others. The FS300 can record in 3 different formats – High Quality, Standard Quality and Long Play. Canons are usually very good when it comes to lens quality the FS300 has a 680,000 pixel CCD Image Sensor and has a superb 37X optical zoom which makes it easily the best camcorder when it comes to optical zoom power. There’s also a USB connector to transfer video from the camera directly if you prefer. Although the FS300 has been discontinued by Canon, it still comes with a guarantee and is still definitely worth considering because of it’s impressive battery life and optical zoom. Arguably the main reason SD card camcorders are the best video cameras for Mac is because they are just as convenient as the digital cameras when it comes to transferring footage to your hard drive. All you need to do is simply take out the SD card, pop it into your Mac (which already has an SD card slot) and all of your video is transferred without the need for cables. In addition, while MiniDV camcorders (which use small tapes) and MiniDVD camcorders (which use MiniDVDs) and even Digital8 camcorders are still available, they are becoming increasingly outdated and are generally not very compatible with Macs. Anything that doesn’t record onto an SD card will require connecting to your Mac by cable and as you’ll see later on, this gets complicated depending on what type of Mac and what type of cable your video camera supports. Of course, camcorders that record onto an SD card usually also have the option to connect directly via USB cable too from the camcorder but you have the added convenience of being able to simply take out the SD card and slot it straight into your Mac. SD card camcorders have other advantages too. They are more responsive for example – there are no moving tape parts which means much quicker response times when hitting play and record. SD card cameras are also more shock resistant than DV tape cameras. If you get nudged or accidentally knock or drop the camera, the footage remains safe on the SD card whereas tapes are more likely to get damages or jammed inside. The lack of moving parts and magnetic strips found in tapes also means that over time, SD cards are far more resistant to degradation or damage and stand the test of time better than tapes or DVDs. Another advantage is that most modern TVs and flat screens also allow you to insert SD cards and instantly playback your raw footage – no messing around connecting the camcorder to the TV. Finally, SD cards are also very cheap and getting cheaper all the time. The market for SD cards is very competitive and you can now find very cheap 64GB SD Cards which is enough for at least 20 hours of video or more depending on the quality settings you use. Of course, the one thing to be careful of with SD cards is to make sure you don’t lose them! SD cards are very small – not much bigger than a postage stamp – and it’s easy to misplace or lose them if you’re not careful with where you store them when you take them out of your camcorder. If you do choose a camcorder that records onto tape or MiniDVD, you have no choice but to use a cable and the problem is the type of connections being used by manufacturers and Macs can be quite confusing and is constantly changing. At the moment, there are basically three types of cable connections available to transfer video and other data to Macs: USB, FireWire and Thunderbolt. Transferring video via USB is the most common way of transferring video to Mac although the speed of it depends on the type of USB port you have. Most Macs up until 2011 have a USB 2.0 port which can transfer at up to 480 Megabits per second for which you’ll need a USB 2.0 cable but Macs from 2012 have the faster USB 3.0 ports which can reach 640 Megabits per second with a USB 3.0 cable. The argument over whether USB 3.0 is faster than SD cards for transfers depends on various factors. These mainly concern the type of camcorder you’re using and the read-write speed of the SD card. Without going into too many boring details though, the truth is that there isn’t a great deal of difference but USB involves the extra hassle of connecting a cable to your Mac and SD cards do not. USB is the oldest way of transferring video and all Macs have USB ports and all camcorders have a USB port too including SD card camcorders if you want to use it. FireWire is a high speed connection for transferring data to Macs and PCs. FireWire is available in two speeds – 400 Megabits per second and 800 Megabits per second – with 800 by far the most common nowadays. FireWire 800 can transfer at speeds of up to 800 Megabits per second which is only a little bit faster than USB 3.0. The problem is that Apple has now stopped making the FireWire port in Macs from 2011 onwards and replaced it with the faster but far less supported Thunderbolt which still isn’t supported by any camcorders. Thunderbolt is the latest generation of data transfer ports and transfers video at very high speed. Thunderbolt connections can transfer at an incredibly fast 10 Gigabits per second which us around 12 times faster than FireWire 800 and around 15 times faster than USB 3.0. In practical terms, this means that a Thunderbolt port can transfer a 2 hour HD video to your Mac in just 30 minutes – a process that would take several hours with FireWire or USB 3.0. Apple has replaced FireWire ports on Macs from 2011 onwards with the new Thunderbolt standard. The problem is that no camcorders currently support it although if you’ve got a camcorder that has a FireWire connection, you can still connect it your Mac by buying a Thunderbolt to FireWire adapter cable. Note that if you use an adapter cable, you’ll only be able to transfer at FireWire speeds, not Thunderbolt speeds. iMovie is a free video editing software with OS X (the equivalent of Windows Movie Maker on PC) and is ideal for making home movies. The problem with all camcorders is that they don’t always record in a format that is iMovie friendly which is why we’ve specifically selected camcorders that record in a format that iMovie can instantly recognize without the need to convert it. However, to avoid compatibility issues with the latest camcorders, we strongly recommend using the latest version of iMovie which at the moment is iMovie11. iMovie 11 is compatible with all camcorders that record in AVCHD, MP4 and MOV format which all of the camcorders featured here support. If you decide to choose to go for a camcorder that’s not featured in this article, we strongly recommend using Apple’s iMovie camcorder compatibility checker before purchasing. This will let you know whether or not your video camera is supported by iMovie or not. Most major brands and models are supported but it’s worth double checking. One important thing to be aware of if you’re buying a camcorder to use with iMovie is we do not recommend Sony camcorders for Mac users. The reason for this is because they record in 1080-60p resolution which iMovie can’t import without converting the video first which is time-consuming, messy, reduces the quality of the video and adds extra layers of hassle into iMovie importing. So to save yourself a lot of headaches on Mac, our advice is to avoid a Sony camcorder. We also do not recommend HDV camcorders for importing into iMovie. HDV camcorders are the latest generation of camcorders and can record video in broadcast quality High Definition which is four times higher than MiniDV. The advantage of HDV cameras is that the footage is in a format that can be imported directly into iMovie with no conversion or messing about required. However, the disadvantage is that HDV cameras are very expensive – you certainly won’t find one for under $500. HD footage is very large meaning you’ll need a lot of space on your Mac – and probably a Thunderbolt connection and an external hard drive – in order to use it. As with digital cameras, don’t get fooled by gimmicks such as megapixels and zoom capacity. The essential thing to look for in a good quality camcorder is the Image Sensor. Basically, the larger the sensor, the better the quality image. The reason for this is that the bigger the sensor, the more light it can absorb which also mean better footage in low light. We recommend not getting anything smaller than a 1/5 inch sensor if possible. The larger the sensor, the more you’ll pay basically. Also, as with digital cameras, don’t get fooled by powerful digital zooms. It’s optical zoom power you need because it’s far superior to digital zooms as it doesn’t rely on digital enhancements of the image. Don’t go for anything lower than a 10x optical zoom and you’ll have plenty of crystal clear zoom power. Unfortunately, even in 2019 the market for SD card camcorders is still very limited but there are three that tick all the boxes for Mac and iMovie users, the best being the Canon VIXIA HF-R82 closely followed by the Panasonic HC-V770 and Canon FS300. All of them cost well below $500, record to SD cards and import directly into iMovie. The range of SD card or flash memory video cameras is still very limited but this may well improve during 2019. Thunderbolt compatible video cameras for Mac may also emerge onto the market which will offer strong competition to SD cameras due to very fast data transfer speeds. Our favorite remains the Canon VIXIA for it’s generous 32GB internal memory in addition to SD card capacity and Canons in general have a very good track record when it comes to image quality. The Panasonic HC-V770 performs better in low lighting and the WiFi support is a nice touch if you want to connect it to your iPad or iPhone. The Canon FS300 meanwhile still has the best battery life although you might want to wait until later in the year when Canon may launch an updated version of the currently discontinued model. Note that we don’t recommend using camcorders to setup a home surveillance system. There are much better surveillance and security cameras for Macs that are made for exactly this. If you’ve got any experiences, questions or doubts about these video cameras for Mac or have any recommendations for other models, let us know in the comments below.